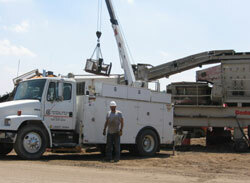 Crusher Service, Rock Crushing Mechanic, Crusher Technician :: Central Service and Supply, Inc. Need an experienced, capable Crusher Mechanic? Central Service & Supply has two very experienced crusher mechanics with many years of experience working on Metso / Nordberg / Allis / Svedala crushers & screens, Cedarapids-Eljay crushers & screens, McLanahan and Eagle Iron Works washing equipment, as well as many other brands. Give them a call for your next service project or breakdown.